Last night, Microsoft dropped a whole bunch of new apps on our laps that help round out their Office presence on Android. Not only did they take their Office preview out of “preview” with new apps for Word, Excel, and PowerPoint, but they released an email app that you may want to give a serious look at. 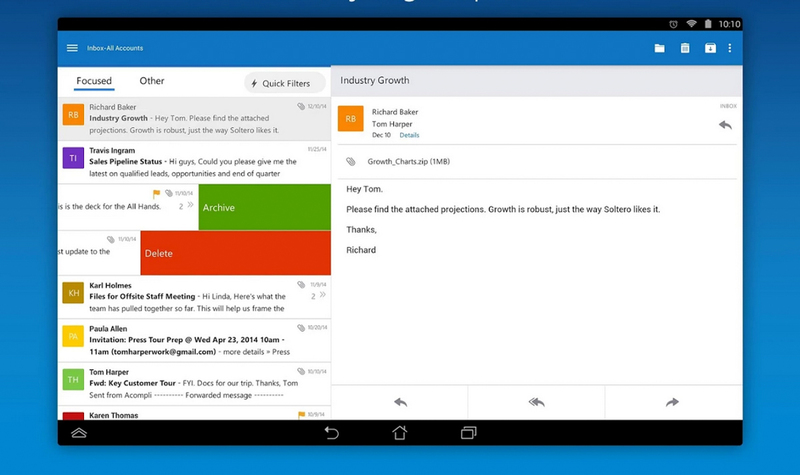 Yep, Microsoft Outlook is now available on Android. Microsoft Outlook for Android gives you “one unified view of your email, calendar, contacts, and attachments,” to hopefully give you the opportunity to get more done, more easily. You can view the integrated calendar, share available meeting times, schedule meetings, attach files from OneDrive or Dropbox, and of course, login with a variety of different email services (Microsoft Exchange, Gmail, Outlook.com, Yahoo Mail, iCloud, etc.). The app is built beautifully with sliding animations, there are swipe gestures that archive/delete/schedule messages (like in Inbox or Mailbox), a unified inbox that tries to surface your most important email first can be toggled on, and the integrated calendar is quite lovely. Oh, the ease of adding files once you have your accounts attached is quite remarkable. The app is in “preview,” so it still has some work ahead of it, but man, this is fantastic first effort. I may even ditch Mailbox for a few days and give it a real shot.